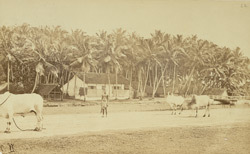 Photograph with a view looking across a road to coconut trees beyond at Pointe de Galle (now Galle) in Sri Lanka, taken by Joseph Lawton in c.1868, from a collection of nine prints which belonged to Stanley Leighton MP. Lawton, who had set up a commercial practice in Kandy in c.1866, became well known as a talented photographer. In 1870 he was appointed Photographer to the Committee on Ancient Architecture which had been set up by the Government to 'explore, take photographs, decipher desriptions, and endeavour to trace the history of each work in various parts of the island.' Galle was an important commercial port in the colonial period: in the 16th century when it was occupied by Portugal, and later under the Dutch who enhanced the town and fort. Following the improvement of the port of Colombo by the British during the 19th century, the prosperity of Galle declined. Galle was known for its profusion of trees, and particularly the coconut palm. It exported coconut oil and coir (the fibre from the outer covering of the coconut shell).